Yesterday we went out and look for furniture. Sometimes me and hubby don't have the same taste in furniture. I am more leaning towards modern furniture while he wants a bit of traditional and modern combined. I hope that we will be able to come up with the best solution of what we wanted. 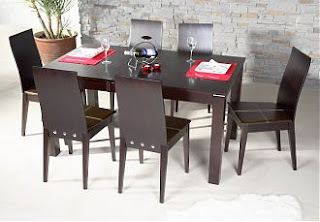 I am looking at a dining furniture just like the picture below. Clean, smooth lines and not busy.